Remote control and data retrieval in bytran 1.3 may be carried out over the classic Bluetooth connection using the Serial Port Profile (SPP) based on the RFCOMM protocol (serial port emulation) with a UUID: 00001101-0000-1000-8000-00805f9b34fb . This functionality is available under all platforms with the exception of iOS and maybe Windows desktop operating systems older than Windows 10. Please note that bytran may still be controlled from a device running iOS as long as the bytran program is executed on a device which does not run iOS (i.e. 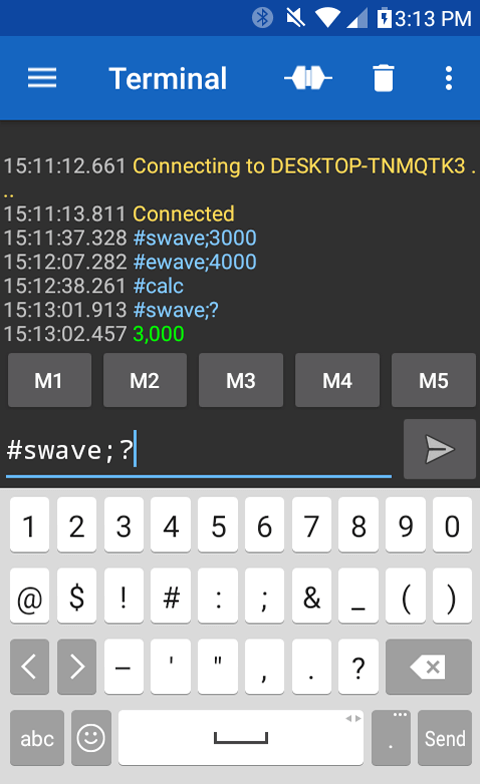 communicating from an iPhone with bytran running on an Android phone). This restriction is caused by the fact that the Qt development environment used to develop bytran currently does not support classic Bluetooth connectivity under iOS. 1) Install the Serial Bluetooth Terminal application onto the Android phone to be used to control bytran remotely (see Figure 1 below). 2) Install bytran on another device (excluding devices running iOS) such as a cell phone or a computer. 3) Pair the device running the Bluetooth Serial Terminal application with the device running bytran. 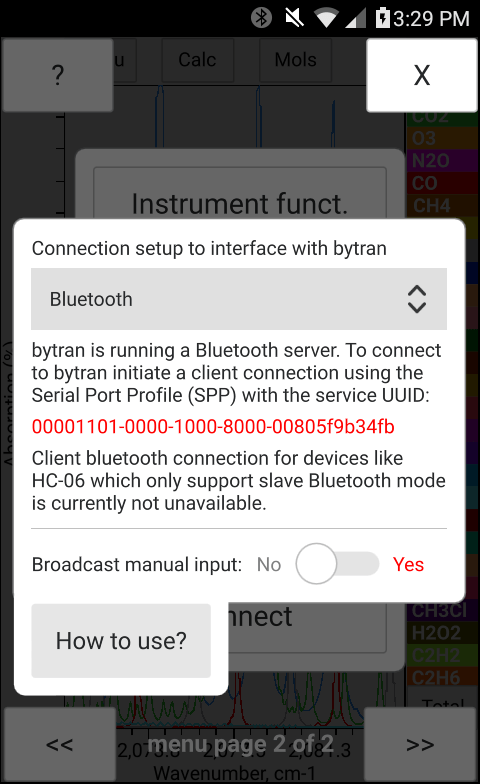 4) In the bytran application, navigate to the second page of the menu, select the "Connect" option, and choose "Bluetooth" (see Figure 2 below). 5) In the Bluetooth Serial Teminal application select the device running bytran as active device to connect to under the "Devices" menu. 6) Click the connect icon at the top right of the Bluetooth Serial Terminal application. 7) The bytran Bluetooth window will update to list the connected bluetooth device (see Figure 3 below). 8) Send commands to bytran from the Bluetooth Serial Terminal application (see Figure 1 below) according to the bytran communication protocol to control bytran over bluetooth. Bluetooth setup in bytran for remote control and data retrieval over Bluetooth using Serial Port Profile (SPP) based on RFCOMM protocol.